Boost your business with resume writing services. If you're looking for extra income for your business, learning how to find freelance resume writing work is a smart move. Writing resumes can be a very lucrative freelance writing specialty. Quint Careers has two general resume writing tutorials. 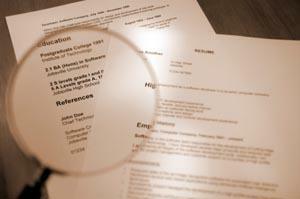 The Write Biz talks about the characteristics of a great resume. Blue Sky Resumes offers a free resume writing e-course. The process to find freelance resume writing work is quite similar to what you'd expect when searching for any other type of freelance writing assignment. First, you need to let people know you're available for work by creating a Web site and online portfolio. If you need samples, offer to prepare free resumes for your friends and family to get started. However, it's a good idea to change addresses, phone numbers, and other identifying details to address potential privacy concerns. Put an ad in the local newspaper. Post fliers advertising your services at places job seekers are likely to frequent, such as coffee shops, copy centers, and the public library. Offer a referral bonus for satisfied customers who help bring in new work for you. For example, you might offer to provide a free cover letter or a coupon good for a certain percentage off your services for anyone who refers a new client to your business. Keep in mind that everyone needs a resume, including cashiers, hairdressers, secretaries, teachers, and insurance agents. Never leave your home without a stack of business cards to hand out to potential clients! Bidding sites, such as Guru and Rent a Coder, may also have occasional resume writing jobs available. While these assignments tend to be low paying, they can be a good way to develop a variety of samples for your portfolio while honing your writing skills. Freelance writing fees are always a topic of debate among novice freelance writers, including those who wish to prepare resumes as part of their business. Rates for resume writers vary according to location as well as the type of resume being prepared. However, it's not uncommon for a writer to earn $50 or more for a resume rewrite and $100 or more for a resume prepared from scratch. Additional fees are often charged for customized cover letters. One way to justify charging higher fees for your resume writing services is to become certified through the National Resume Writers' Association. Certification tells prospective clients you are serious about your work. Additionally, the NRWA offers a number of professional development resources that can help you further advance your career.